Today I’m teaming up with other Instagram teacher-friends to bring you the “Everyday Dress” by Turquoise & Tangerine styled 3 ways! October is here, and I am excitedly pulling out my fall sweaters, dresses, booties, and jackets as our temperatures finally drop below triple digits here. With that in mind, I decided to style my navy dress c/o Turquoise & Tangerine for the fall season. Colorblock cardigans have been on the front page of many boutique and store websites over the last month. I think it’s so trendy, and looks nice over a dress, too! I found this one on Jane.com, and loved the price tag as opposed to the expensive Madewell ones. I also think putting a colorblock knit kimono like this one would be a cute option. I think navy, white, and gold are such complimenting colors together. It does remind me a bit of summertime and gives off a nautical feeling, yet put a casual spin on this dress for fall with my slip on sneakers. When it comes to a navy dress, you can’t go wrong throwing a classic denim jacket like this one over it, or adding a scarf or wrap for another look. Right now, I’m doing a giveaway on today’s Instagram post! Plus, you can see the other looks that were put together with this dress on my Instagram teacher-friends Leslie, Aisha, and Sarah! Get 20% off this dress with code TEACHERFASHIONISTA20 when shopping with Turquoise and Tangerine! 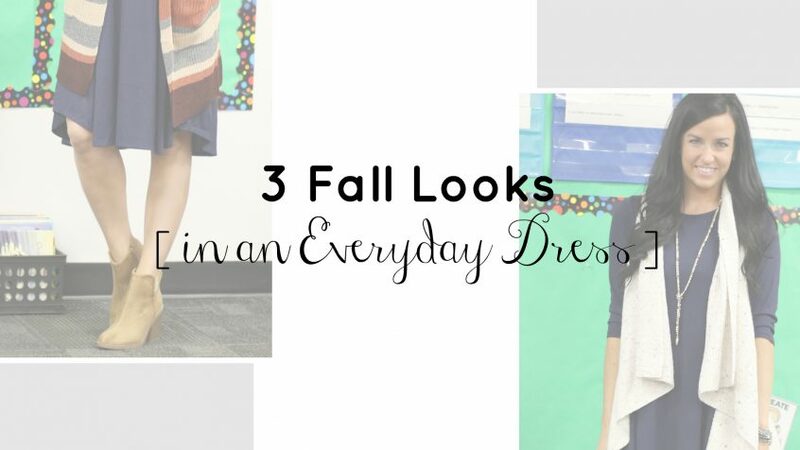 Do you have a go-to dress for fall? This one is really a perfect length for work, and I like the 3/4 length sleeves. Thank you for your kind comment! I do love cardigans and wear them often in Arizona since morning/evening temps can be much cooler than daytime ones.